When building an application, you may need to repeat code a set number of times or until a specified condition is met. For example, you may have a section of code that you know you want to run three times. You may want your code to keep running until a user clicks a stop button. You can use loops to do this. A loop is a programming element that executes the same code multiple times, or iterations. 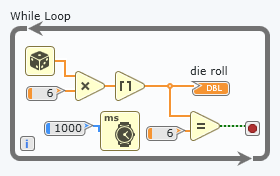 You can use the following loops to repeat code in G Dataflow: a For Loop and a While Loop. 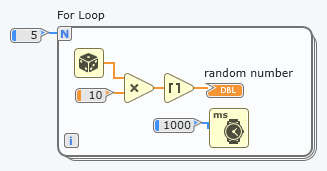 For Loop Repeats the code inside the loop for a set number of iterations. Generate five random numbers between 1 and 10. While Loop Repeats the code inside the loop until a specified condition is met. Continue rolling a die until the value of the die is 6.